In realtà non sono Lupi ma cane lupo cecoslovacco. È una razza canina relativamente recente, nata da un esperimento condotto nel 1955 nell'allora Cecoslovacchia. Dopo aver creato una linea di selezione incrociando 48 esemplari di cane da pastore tedesco da lavoro con quattro lupi euroasiatici (Brita, Argo, Sarik e Lejdy), il progetto fu quello di creare una razza di ibrido tra cane e lupo che avesse la tempra, la mentalità e l'addestrabilità di un pastore tedesco e la forza, le caratteristiche fisiche e la resistenza di un lupo: in sostanza l'aspetto del lupo e il carattere del cane. 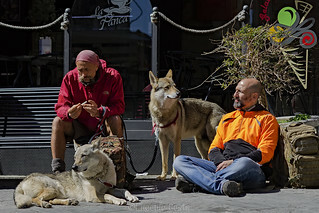 In reality they are not Wolves but Czechoslovakian wolfdog. It is a relatively recent dog breed, born from an experiment conducted in 1955 in the then Czechoslovakia. 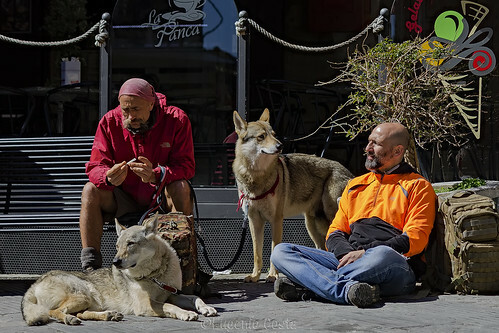 After creating a selection line crossing 48 specimens of German working shepherd dog with four Eurasian wolves (Brita, Argo, Sarik and Lejdy), the project was to create a hybrid dog-wolf breed that had the temper, the mentality and trainability of a German shepherd and the strength, physical characteristics and endurance of a wolf: in essence the appearance of the wolf and the character of the dog.